Music, movies, and other stuff you get perks for covering. I can remember my mother making baloney salad–Oscar Mayer bologna, pickles, onion pushed through a kitchen meat grinder. The grinder was a big solid steel thing that you’d vice clamp to the counter and turn the crank. It was so 19th century I can’t believe this was in my lifetime. 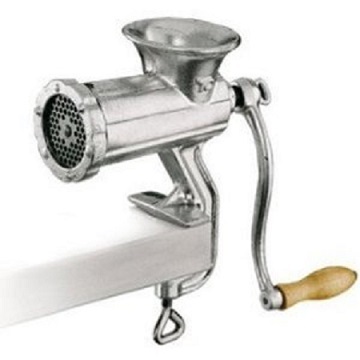 In fact, our meat grinder was probably not much different from the one patented in 1845. It had revolutionized sausage making and made hamburger stands possible, but we made baloney salad. Being the eldest, my job was to turn the crank. Watch your fingers my mother warned. I was probably six or seven, and all my younger siblings watched, amazed, as the baloney came out a ground up mess. Then the pickles went into the grinder, the crank would go round and round, and unlike the bologna, I could feel the pickles being pulverized, like the fingers my mother warned me about. Then in went the onion with a satisfying crunch. You mix ’em up together in a bowl and add lots of mayonnaise. Baloney salad. We loved it. Not sure about now. 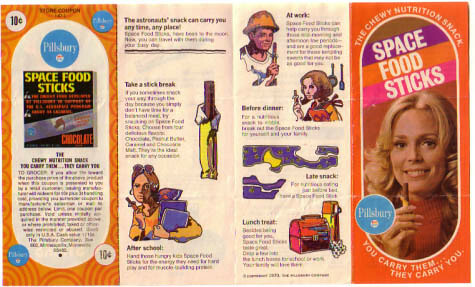 Within a few years there were astronauts on the moon and it was all space food sticks. Then microwave ovens. Now people post pictures of food and we all gain digital sustenance. I don’t post pictures of food. Or cats. I do post pictures of manual meat grinders, though. Meat grinder. Every kitchen of tomorrow had one in 1845. This entry was posted in Eats and tagged Baloney salad, Oscar Mayer bologna. Bookmark the permalink. You just aged yourself when someone says Mark Almond and you thought they said Mark-Almond.